“For I want you to know how much I am struggling for you, and for those in Laodicea, and for all who have not seen me face to face. I want their hearts to be encouraged and united in love, so that they may have all the riches of assured understanding and have the knowledge of God’s mystery, that is, Christ himself, in whom are hidden all the treasures of wisdom and knowledge. I am saying this so that no one may deceive you with plausible arguments. For though I am absent in body, yet I am with you in spirit, and I rejoice to see your morale and the firmness of your faith in Christ. As you therefore have received Christ Jesus the Lord, continue to live your lives in him, rooted and built up in him and established in the faith, just as you were taught, abounding in thanksgiving. See to it that no one takes you captive through philosophy and empty deceit, according to human tradition, according to the elemental spirits of the universe, and not according to Christ. For in him the whole fullness of deity dwells bodily, and you have come to fullness in him, who is the head of every ruler and authority.” (Colossians 2:1-10) This is the word of the Lord. Last year, the theme was change. We have reflected upon change, and then we have also experienced a change. Actually and personally, I experienced a lot of changes last year. My daughter got married and my son had a son, so I became grandfather and hal-abeoji in Korean. But you know, these days, grandfather, it’s not necessarily very, very old. It’s not like his life is almost over now. There’s a lot of young and cool grandfathers. So in 2014 I realized that, you know, God has been so good in many ways. Whenever we encounter difficulties and hardships. God always tells people to hope and that it’s okay. Things will turn out alright so don’t give up, you know? Also, when we experience dangers and crisis, God always showed us a way out. And when we are so down in darkness, God always gave us the light. Gave us the hope to go on and move on. So we are very thankful for a god who has been with us, all along in the past year of 2014. I do believe that God will be with you in your life and guide you and lead you and God will show you much, much more wonderful and mysterious things. I think in 2015, I pray that your life becomes much, much fuller this year and the next year. So this year the theme is a journey to fullness and that’s what we are going to explore this year – journey to fullness. 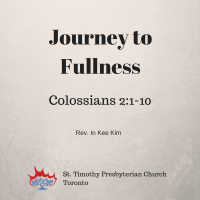 As Pastor Jane said, let us think about these two words, journey and fullness. For this today, this is just the introduction of that theme, but throughout the whole year we are going to reflect on a journey and fullness. I like the word journey, life as a journey. When I hear that life is a journey, I feel that life is moving. It’s not static, it’s not just staying where you are. Life is not like the turning wheel or mouse wheel or turning butter in the same place. The life is not just turning around and around and around. Life is going somewhere, progressing towards somewhere. So journey tells me that it has a movement, life has a movement, and I like that. Life has movement. I mean, sometimes we don’t feel like our life is moving at all because you know, when I first start Monday I get a little bit of rest and already prepare a sermon for Sunday. Then Tuesday, Wednesday, Thursday, everything happens in it. All of a sudden another Monday. So sometimes you feel like you are almost enslaved to your routine and everything. But I believe that life is about moving towards something. So life as a journey is that life has a goal and direction. Life is not as floating around. It is intentional, an intentional journey. That’s what the journey is. Life is not just floating around by the power of the windmill around you, but you are making a conscious and intentional step towards the goal or any set direction in your life. Life as a journey is a beautiful thing. As I looked at my own life, as we look back our own lives, we realized that there was a certain path. There were certain roads, a certain way, a certain path that we have walked a long. You know, when I look back… 10 years ago, 20 years ago, even 30 years ago… Oh yeah, I lived here longer than 30 years, and 40 years ago I could never imagine that where I am now. I can’t even think about where I’ll be. So back then I didn’t really know what I would be like in 20 years, 30 years, 40 years down the road, especially with high school students here. And then I can sit down and think about, in 20 years or 30 years, 40 years…. In 40 years will I be that old man up there? Can you imagine what I mean? I don’t think you guys think about these things. When I saw Joel reading the scripture, “Wow, John is standing very strong and solid, you know.” So life, we cannot even imagine what it will be like in 20, 30, 40 years. That’s what life is, and this path that we have walked on is what’s created and paved by the people that we’ve met. By the experiences that we had, whether good or bad, or the peers that you made, or the choices that you’ve made. All these things helped your path be created in a way. Depending on the people you met, certain path is also created in your life. So whatever you live, whatever you do in your life… that creates a certain path for you to walk on. One thing unique about life as a journey is that you don’t always have a path, or you can’t always can see that path. That’s one thing that’s unique about a life journey. It’s not that the paved road is there and you just walk on it. All of you take the 401 and you go somewhere. It’s not like that. Sometimes you don’t see the path. Sometimes there is no path, period. “So here, what am I going to do now? Which path? There’s no path that I can see.” That’s what life journey is like. From here, at this point, where do I go? I don’t know many times. That is what’s unique about life journey. Sometimes you have to find that path. You have to think very hard to find a path, or other times you may even have to create a path, because there is no path. So you have to paint the path, create the path to walk on it. The path other people took, it’s not necessarily the path for me. But the path my friends take is not necessarily the path for me. You don’t want to follow other people’s paths. You want to walk your own path. Your life is one life that you have. You don’t want to walk on the path that other people paved. That is a copy of people’s lives. You don’t want to live a copy of life. You want to live an original of your life. I don’t want to repeat what other people do in my life. I want to see what’s in store for me originally and uniquely for me. God has created me not just as a kind of product manufacturer by the factory, God created me as a very, very unique person. That means I have a unique life that I have to live, and I have to find a unique path that God wants me to at all costs. No matter how great the other person’s path may be, that may not necessarily be the path for me. This is what Jesus said once, entering through the narrow gate for the gate is wide and the road is easy. That leads to destruction and there are many who taken for the gate is narrow and the road is hard. That leads to life. And there are few who find it. Narrower road, narrow path. I took a picture once at knox college. Narrow path, a narrow road. I mean Jesus said walk on the narrow path, go through the narrow gate and some of you most of will think that, oh, that’s Jesus is telling us to take a hard life, difficult life. I mean, it’s true. A lot of people take certain path because it’s easy. That’s why a lot of people take it. So narrow path can be sometimes difficult and hard. Not many people want to take it because it’s hard. It is true that Jesus was talking about life being hard and difficult, but I don’t think Jesus was talking just about a hard and difficult life. What Jesus is saying is the unique path that you want to take that had been taken. That’s the narrow road. Not what everybody else is doing, but what you want to do, what you want to achieve, what you want to be in your life. That’s a very narrow road that I need to take. Sometimes that road can be lonely because nobody else shares your region. No one else shows you your dreams. It’s your unique dream and it doesn’t matter what it is. It may not be a popular dream, it may be an unpopular thing that people want to do. “I want to do this, so I feel lonely because nobody else shared…” How great you’re doing up that path. The one less traveled by people, that had made all the difference in my life in your life. So our journey is the journey of finding my own unique life. It may not be glamorous, it may not be envied by people. You may not be rich and famous life. It must be my own life. It must be my colour, taste, smell and my own, not anybody else’s. So this journey in that sense can be a lonely journey. But when you take that journey, on the road, you will find yourself, you will discover yourself. You will get to know yourself more deeply. If you continuously trying to copy other people’s lives in that journey, you can never find yourself because it’s not you on that journey. You’re just following other people. You’re just copying other people’s lives. But when we take my own unique, authentic journey and life on the road, we discover who we are, what we really like, what we really don’t like. Well, it’s my vision. What is my dream? We find that on the road. There’s a famous apostle St Paul. St Paul was on the journey to Damascus when he took that journey to Damascus. He tried to kill off Christians and imprison Christians. He was full of himself. He was full of his stubborn own ideas. How he should live. So he took that journey in himself thinking that these Christians are supposed to be persecuted. But on that journey he met Christ. That was mysterious encounter and he met Christ. After that he’s changed completely. He was looking for the mystery and great treasure in Christ. I mean this is a what a St Paul said. “For in him the whole fullness of deity dwells bodily, and you have been filled in him, who is the head of all rule and authority.” He found this quest in him in treasure in Christ. So my friends, every decision you are making, it’s reflecting who you are and has to reflect who you are. Therefore every decision you make create your own unique path. That’s why you have to make very intentional decision. Don’t let other people make decisions for you. You have to make decision on your own because that creates unique path for you. We may not always know the best, best decision. I made so many wrong decisions and you probably made many, many wrong decisions, but what is important is that decision is my own because we don’t see what’s ahead of us. We cannot make always the good decision. We made the wrong decision, but that’s all right, but it has to be your decision, not anybody else’s decision. You know, if you let other people decide what happens to you, after that h, my mother told me to the this, or my grandfather told me to do this, or you know, my friends told me do to this. You’re just blaming other people. You have to make your decision. And that’s very important. But let me tell you, our ultimate goal though of our journey is not to find me. Our ultimate goal is to find the way of Christ. I do believe that is ultimate goal of my journey to find the way of Christ as we just read the scripture because there is fullness in Christ. Our journey is not just to find me, our journey is to find Christ. That’s why your journey, when you take a journey to find Christ, your journey becomes mysterious journey and spiritual journey. It’s like finding hidden treasures. St Paul found that hidden treasure on the road to Damascus, and this is what he said also verse 2-3,” I want their hearts to be encouraged and united in love, so that they may have all the riches of assured understanding and have the knowledge of God’s mystery, that is, Christ himself, in whom are hidden all the treasures of wisdom and knowledge.” Ultimately, let me just find me. We’ll find entities. But when we find Christ, you will see the treasure, the hidden treasures of wisdom and knowledge. I am the 2015 becomes a journey. Of came to know Christ more fully, more deeply, more intimately. Then to do that, of course, you had to take your own unique journey. That’s the way that leads you to Christ. If you copy other people’s lives, you can never find Christ. When you start taking your own unique journey, that takes you to Christ. That’s the first step. Ultimately I hope you get to know Christ in the authentic way, in your unique way. When you copy other people, you will end up with that person’s emptiness. Or when you take that spiritual journey seriously, day by day, uniquely, and you find Christ, you find all the wisdom and knowledge hidden. So journey to fullness in a sense is a journey to emptiness. You need to find yourself and then deny yourself. Find yourself and then empty yourself. When you find yourself, you empty yourself if don’t understand that’s fine. You will understand later in your life you. If find yourself only then you can empty yourself and deny yourself. So journey to fullness in a way journey to emptiness. The first part journey is what we do. But second part, fullness, this is what God does. In the first part we continuously do the journey to emptiness and then second part, God comes and gives you the fullness. We don’t create fullness. It is a gift from God. 2015, it will be an exciting year to take a great journey. High-school students, Hi-C, I hope that in 20 years down the road, 2015 was turning point in my life. I teach you the journey of life. Happy New Year. May you have a blessed year this year.